Clara Hargraves is a clever and spirited young girl with red hair to match her fiery personality. She has just turned fourteen years old and her step-mother expects her to start behaving like a proper young lady. This is quite vexing for Clara as she loves to swim in the pond near her home; and, in her estimation, riding side-saddle is entirely ridiculous. It doesn't help that Clara resents her step-mother (her mother's sister), for trying to take on the role her mom once had. To make matters worse her step-mother is now with child. For weeks now, it seems all anyone can speak of in her small New Hampshire town is Lafayette, a French aristocrat who relinquished his title and became the nation's darling as he aided America during its struggle for independence. Lafayette has become such an iconic figure of the day that his likeness adorns ladies' gloves, fans and more. So when it's rumored that Lafayette might be passing through, her town is abuzz. Clara enjoys hearing about Lafayette and the many reasons for which he has become a hero to her country, but more importantly she dreams of changing her unseemly red hair to a lovely shade of black. A Buss from Lafayette, by Dorothea Jensen, is a fun and fascinating read. Jensen weaves threads of historical fact within this coming-of-age story that will resonate with young audiences on many levels. 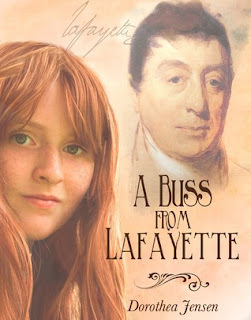 Readers will love the tale of the highly relatable Clara and may even learn a thing or two about why Lafayette was so highly esteemed in American in the 1800s. This book is recommended for home and school libraries and has earned the Literary Classics Seal of Approval.